Happily teaching at a vocational college. 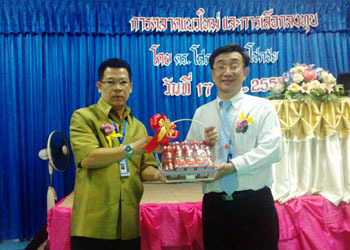 Dr.Sopon Pornchokchai was invited to be a guest speaker at this Sarasas Business Adminstration School which is a vocational college for some 50 students. He has been teaching at undergraduate, graduate or doctoral levels as well as a military school and other higher educational institutions. This is a good opportunity to speak to college students. He was presented with gifts as well as remuneration; however, he did not receive them.